Being Sick on the Farm and Still Feeling Like A Million Bucks! I picked up a nasty cold a few days ago. I rarely get sick. I think farm life and being outside every day, being active doing physical work and being around animals all day makes for healthier living. I get enough germs in me each day being around all this dirt and muck that I probably have a fairly robust immune system. This is the first bad cold/flu I've had in years. It has made doing chores more challenging that is for sure. What I have found though is that I sure have some great friends. They have come and offered to help with chores, help get errands and bring in groceries and just been fantastic. When I lived down south and worked as an engineer, I never had anyone do things like this for me. I don't know if city folk just don't think about doing that for each other or if I was just independent minded that I never allowed others to come and help me out. Having a farm and tending to animals, I have had to change that attitude of being so independent. I had to quickly learn that there were many times that I needed a helping hand. If an animal were sick or injured, I couldn't hold them and tend to their needs. I had to reach out to my alpaca neighbors and friends to give me a hand from time to time. That was one of the harder things I had to learn believe it or not. I never mind helping others but accepting help has not been as easy. It is kind of sad that we see reaching out for help as such a sign of weakness. I'm not sure if I learned that because of being in a male dominated field for so long and unfortunately had a number of supervisors that were looking for any signs of weakness on my part. It was quite engrained in me that fierce independence. Boy was I ever wrong in that attitude. It took a bit before I figured out that the key to asking for help is to ask the right folks too. 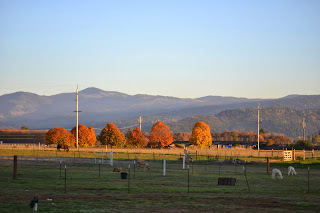 I've been so fortunate that when I moved to Oregon, I found some amazing friends that come through for me. They have been here for the good times and the bad, the animal illnesses and my own and I have been there for them in return. It's how it should be! Life is way too hard to keep having that mindset that Independence is a virtue. Yes, we need to be independent and interdependent. A community needs each other. Somehow we have become so much about "me, me, me," in this culture that we have lost that connection to the other. There is such strength from having a community. So as I hack away and go through a box of tissues, I'm so grateful for those that brought me soup and helped me rake my fields and feed my critters. I still feel like crud but at the same time, I feel like a million bucks knowing I have such wonderful friends! I was sent this great article today on Fashion Designers from New York city heading to Peru to learn more about how to incorporate Alpaca fiber into their product lines. This is awesome!!! This is so what our Alpaca Industry needs. I've been on my soap box a lot lately talking about how we need more product driven ventures. On CNN last night, they had a documentary on Ted Turner and my ears perked up on one of the briefest comments of the entire show. He mentioned his Bison venture and how way back when he first started it, he had the vision that he had to have an end use to make it a viable and growing venture. So he started restaurants that served Bison meat. It was all part of the big picture of his breeding and livestock business. It had to go hand in hand as he bred and grew the herd. If you don't have a solid end state, then we quickly run out of ways of selling and bringing in income. If all we do is sell to each other, we will have a glutted market. We have small starts in bringing alpaca to more textile products but we have a long way to go. These New York Designers are a great start in making this concept come to fruition. What is missing in this article is US Alpaca breeders going with these designers to learn too what they need from us as the crop providers. I'm afraid they will go to Peru for their end product needs when we have so much wonderful and beautiful fiber here in the US. We need to be a part of this! Instead of worrying about whether we should merge the Alpaca Owners and Breeders Association and Alpaca Registry, Inc, we should be pushing to have teams working with these designers. Then we wouldn't need to worry about financial challenges because we will be building a viable industry that will need these two entities. We need to have visionaries that see our industry grow into more markets. How business has worked for the first twenty years of this industry is not going to sustain it. We need to quickly transition to a true textile provider. I say to you alpaca breeders who may know some of those fashion designers, start asking them what they need from us so we can start making it! These are opportunities for us and for those of you that have that entrepreneurial eye. Let's get cracking! It is time to set this industry on the road to success. And I define that success not just by how many Color Championships and Blue Ribbons I have won in a show ring but by us getting our fiber out of our barns and filling up mills and manufacturers with our homegrown, lush and wonderful alpaca fiber!!!! Ready to supply fashion designers US grown alpaca fiber! I know we all think we are better listeners than what we truly are. I admit to that. I get into my routine and walk past things a dozen times or more without seeing it. I can be very unobservant at times. However, I have trained myself to be more observant with my alpacas. I've done so because it has created a better relationship between us. How true would that be for the rest of our relationships! In the beginning, I had to be very focused and concentrate on what I was seeing in my alpacas. They communicate mostly through their body language and so I had to learn some of their subtle signs of what was going on. I'm still learning that language! If I went to a foreign country where I didn't speak the language and it's root language was so different than the English language, I'd be clueless what was being said. I'd have to use body language to communicate. Think of the effort and focus that would be required to step into a situation like that. When we communicate with animals in the beginning, that is a good example to keep in mind. 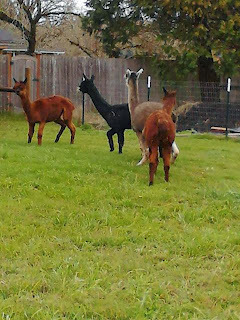 Alpacas being prey animals, the signs of fear they demonstrate are important signals to learn. There isn't just one sign that shows they are afraid. They have a multitude of them and they can show one or more at any given time and depending on how fearful they are. 1) The alpacas ears can be pinned way back on its head. Or the ears can also be very erect and pointing towards the area they see danger coming from. A friend brought her puppy over for a visit recently and all the alpacas came running to see what this new "wolf-like" creature was. Their ears were very erect and pointed towards the puppy. 2) Their eyes can be real indicators of fear. They get larger and dilated and when in extreme fear, the whites of the eye can be seen. 3) The alpacas can flare their nostrils as their respiration rate increases and even have open mouth breathing. I see this once in awhile the first time I halter a weanling. I'm very mindful when I see that and work hard to breath deeply and slowly to help calm them. I also do some TTouch or other calming techniques and if at all possible, keep the training session very short to show them that having the halter on isn't going to kill them (literally!). 4) Alpacas also have the vocalization of alarm sounds and/or humming. But I usually see the other signs above before I hear the trumpeting alarm sound. During shearing especially, I often will see signs of large dilated eyes, flaring nostrils and rapid respiration rate. 5) And of course, one of the more noted signs of fear is spitting. 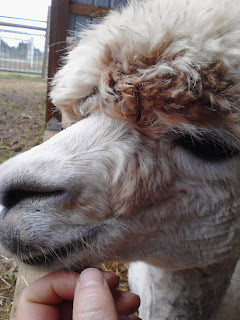 6) For my social alpacas that enjoy their treats, another sign they are in a feared state is that they won't take food. If you were afraid something is about to eat you, you probably aren't going to stop and have a bite to eat yourself. When the fight or flight system is triggered, the digestive system shuts down so the blood flow and energy can go to the vital organs needed to keep oneself alive. So if an alpaca is afraid, they probably won't eat. I was loading several alpacas this weekend to head to their new home. They were extremely anxious and afraid going into this odd vehicle and leaving their normal pastures. Their new owner kept wanting to offer them food to load but I knew they wouldn't take it because they were too afraid. If we had more time to lure them in slowly and had a trailer on the property for days or weeks, then yes, using food to help train and motivate them to load and unload is a great method but when they are as frightened as they were, then we are better using TTouch, breathing, aromatherapy, to help take the edge off of their frightening experience. 7) How alpaca run can often show if they are afraid. When they run with their head low to the ground, that is telling the rest of the herd, they aren't running away from a predator but just want to get someplace quickly. There are probably a lot more signs we can share that describe fear to the alpaca. But these are the more obvious signals and alpaca language that describe fear. These show kids were pretty anxious as we walked to the trailer. Notice how erect the ears are. 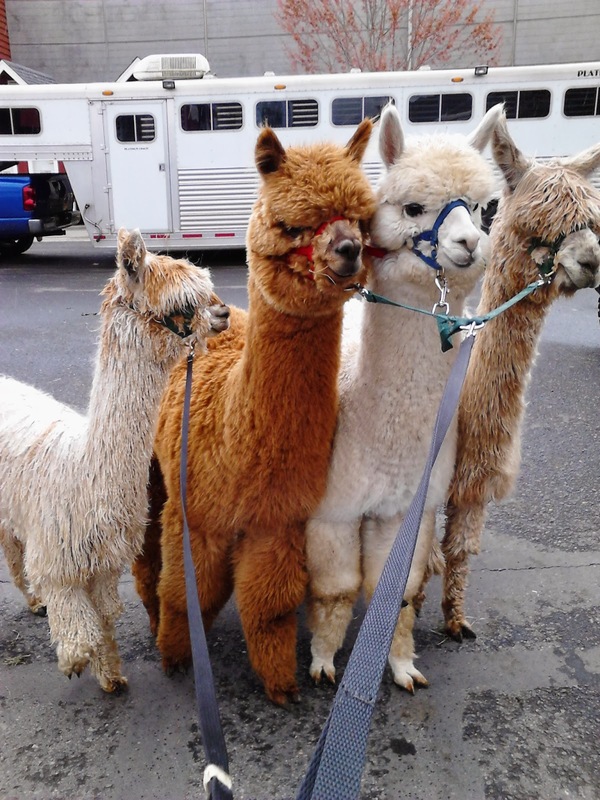 I sent four alpacas to their new home yesterday. I was curious to see if there would be shifting dynamics in the herd group those four were amongst. One alpaca left behind is a 2 year old daughter and she is definitely missing her mom. She looks over the fence and comes to me when I walk into her pasture. She follows me and then goes to the fence looking off in the distance as if hoping to find her mom. Her ears are pinned back as if more anxious. But she isn't so anxious that she is skipping her meals and grazing so those are good signs. The others in that group were not particular buddies with the others and they seem to not miss the others much. The one that left was quite the matriarch and head of that group, so seeing if one of the others takes on that role will be interesting to watch. So far, no one has seemed to be assuming that role, or if they are, not in the same way as Misty did. Misty was the pig of the group too and I do know they are enjoying their meals without someone pushing them out of their bowls! It is always bittersweet sending off animals to their new homes. I miss them, but I'm also very happy that people are getting to enjoy the fruits of my labor with my clicker trained and social alpacas. I got a call today from the new owner telling me all the antics the gang went through in their new home. They are adjusting nicely and checking out all the new grass and areas to roll in and enjoy. They are a little anxious and still not sure if they are coming back here or what is going on. A little humming but that will ease in a day or two. 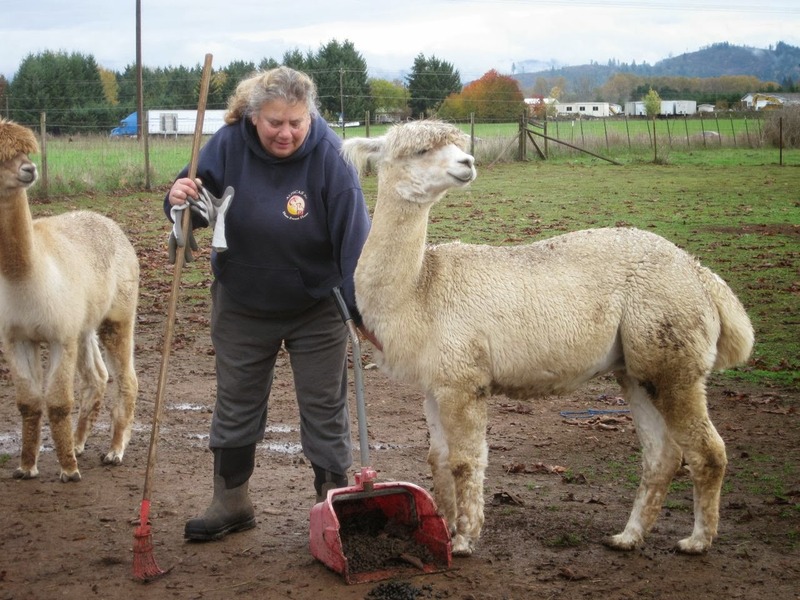 They are lucky alpacas having a wonderful new lovely home and owner to be their shepherdess. I love win/wins and in this case, it is a win/win/win! The alpacas win with a wonderful new home, their owner wins by having 4 lovely, gentle, and friendly alpacas and I win by having a sale and having made a new alpaca farmer friend! Checking out their new home. Look at all this green grass! Weehee!!! I just read an interesting article titled "Breaking the Grass Ceiling: On US Farms, Women are Taking The Reins." This article stated that between 1982-2007, the number of women farmers have doubled and there are about 1,000,000 women farmers here in the U.S. That doesn't include the numbers of women joining the ranks of Veterinarians both small and large animals. When I go to Oregon State University (OSU) Veterinarian Hospital, it is rare that I see any male students anymore. The vast majority are women studying in the field, at least at OSU. Farm life for women is so popular that is is quickly becoming a growing genre for novels where women are buying novels on farm life more than the traditional "chick lit." I know I'm one of those that prefers and enjoys reading the joys and challenges and humor of living on a farm. I laugh harder at some stories because I've been there done that! Saturday I'm attending a workshop on Chainsaw maintenance and proper usage. 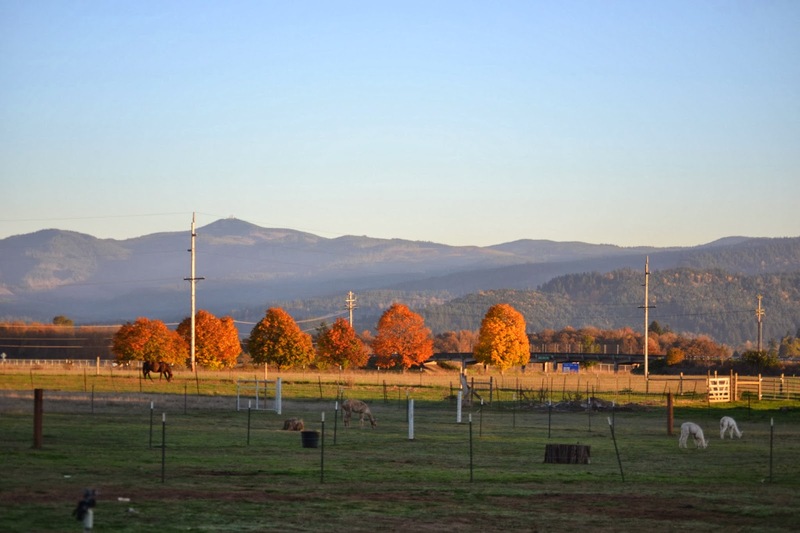 It is being hosted by the Willamette Women's Farm Network (WWFN) which is organized out of OSU. This is such a great group for us women farmers in Oregon. They are an amazing resource of information, workshops, marketing ideas and support. I am always inspired after being around these women and all they do. Such a diverse backgrounds as well as farm interests and businesses. It is an absolute wealth of information and knowledge coming from all these farmers. It is great to once in awhile get off the farm to be around others that totally get my passion for my niche of farming with alpacas. WWFN reminds me a bit of the time when I was in the Women's Executive Leadership Program when I worked for the government. I was surrounded by another very diverse group of women from all agencies in the government from Health and Human Services to all the various branches of the Department of Defense, FBI, the Department of the Interior and Education Dept just to name a few. It was another part of my life where I was working to break that proverbial glass ceiling. I worked for the Navy and dealt with a very antiquated mindset at times being one of the few women engineers working at my base. But being around like minded, career minded and highly capable women, inspired me and gave me much confidence. And WWFN does the same for me today. Being an introvert, I admit I'm not much for groups and I was reluctant to join WWFN. But after being around these women, I'm so glad I did. I come away feeling energized and excited all over again. 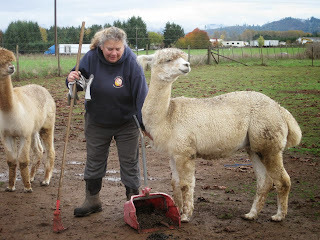 It helps keep the flame and passion going for my alpaca farm business and I get new ideas for trying to break through the tough economy or being more self-reliant on the farm. I am reminded that it is a great time to become a Woman Farmer! I chose alpacas because I felt they were doable for a woman. They are easy to manage and handle and they so fit the other activities I enjoy doing with my spinning and fiber arts. I get to be outside each and everyday and no one cares if I am in my sweat pants and faded old blue jeans. I work hard and it feels like I have accomplished something good each and every day. And, it is a career that I feel like I'm giving back to the environment and society that I love so dearly too. So for you women out there looking for a possible career change. You might want to check into farming. It is a great "growing field!" I was talking to my sister who enjoys taking TTouch classes to work with her horses. 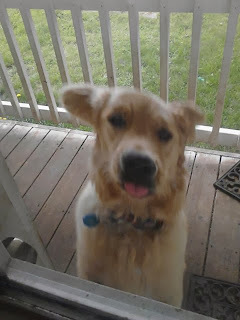 We talked about how important it is just to listen to what your animal is communicating to you. During her recent workshop she attended, there was a student that had a really hard time with the listening skill. They "knew" what they were doing yet they didn't listen at all to the animal's experience and the instructor had to back her off the horse she was working on because he was so agitated and upset. He wanted to get better but when this student wasn't listening that her touches were uncomfortable, he kept amping up his signs to tell her until he was really dangerously upset. The instructor quickly calmed the horse and let him settle. Before she let him go out into the pasture away from their training, she went in and did some techniques on him. She felt how he was very uncomfortable on certain parts of his body and instead of forcing those spots, she backed off and went to other areas he seemed more willing to accept the touch. She ended the session when she saw him briefly take in a little touch. They then let the horse free out in the area outside where they were teaching. He had a large area he could go and get away from them with a positive experience and feeling heard. They expected him to get as far away from their workshop as he could and he had a large area he could run way to, but instead he hung near them with his head low over a rope fenced area watching. He wasn't so upset with them after all, and wanted the TTouch but he also wanted to be heard when it was uncomfortable. If you have ever had a massage and a painful knot is found, a good masseuse knows just how much pressure to apply that helps work out the knot but not create pain. They have learned to listen to your body to know how uncomfortable you are or perhaps you verbalize to them how much they can do. But imagine if you told that masseuse the pressure they were applying was too painful and you were ignored. You certainly would think they don't know what they are doing, you wouldn't want to go back to them again I bet, and you probably would lose trust in them too. Listening to your animals when you first start these touches and techniques is the most important thing you can do. If your touches makes them jump, back off the pressure a bit. Change locations. Stop all together and and just breath gently and watch their eyes soften. You will gain more trust by doing that then giving them the best tasting carrots. When I'm not even working with my alpacas, I'm still listening to them. As I walk by an alpaca and I see them jump or take a step away, I often will take a step away from them too. It is showing them I hear them that I moved into an uncomfortable area of their personal space and since I'm not working with them or needing to catch them, I can show them I am listening to what they just communicated to me and take a step away from them. Almost every single time I do that, I see them stop and instead of taking more steps away, they just stand still. They get that I heard them. Practicing these listening skills with our alpacas can help our listening skills in other interpersonal relationships. Listening is becoming such a lost skill in our culture and yet is probably one of the most important skills if we want to have successful relationships, business, and lives. Learning to listen to what my alpacas like in their TTouches. Miss Marple prefers gentle TTouches under her chin. I love seeing my alpacas learn new things. Even though I'm not surprised at their intelligence anymore, I still get a real sense of excitement when I try something new with them and they get it. Some things I train are for fun and to stimulate their brains. Being so smart, they can get easily bored. I have some pasture space for my herd. Some have bigger pasture areas to graze and others have more limited space. Those with more limited space especially enjoy the training sessions that are just for fun. Even fun turns into much usefulness because they become so much easier to handle and social. I think it helps my males fight a little less because it gives them something else to go do. I notice some of the boys playing with the toy I hung on the fence for them. Even without carrots, I will see them go over and chew at it. It gives them something else to do. Last night, I saw Olivier hanging out at the toy after I was done feeding the herd their pellets. He looked at me and the toy as if to ask if we could play the touch the toy game. I had some leftover pellets in my pail so I came into his pasture. The others were still polishing off their bowls so we had one one one time together. His face lit up as we began and he went right to touching the toy. He would hit it faster and faster as I clicked with my tongue each time he touched the toy. Alpacas will communicate with you that they want something, like pellets at supper time as they hang out near their bowls or at the hay bin if they know it's that time. But to see an alpaca stand by a toy and ask to play the clicker game is just one of the coolest parts of clicker training. I'm heading to a workshop today to learn more about training my dog, Harper. We are working on becoming a therapy dog team. She is perfect for that role with her stereotypical Golden Retriever personality. We both get a lot out of our classes and I get the added bonus of getting ideas to bring back to the farm and trying with the alpacas. It's my version of "Cross Training." I love going to a workshop occasionally. Seeing what other great instructors do helps me get better and gets me thinking outside the box more. 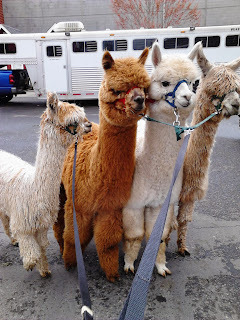 Since there aren't very many alpaca clicker training workshops, I have to go to either dog or equine classes and then I have to figure out how to transfer what I've learned to working with the alpacas. I enjoy that challenge. Hopefully, some new blogs will be coming soon with what I've learned and tried on the herd here at Hum Sweet Hum! Harper excited to head to class! In my last blog, I talked about how I was teaching my alpaca boys patience while they took turns getting their chest scratches. There were a number of cool things that happened during that spontaneous trainable moment. 1) I didn't have any goodies on me. The chest scratches were the reward. If you ask an alpaca farmers if on their list of things they'd offer an alpaca as a reward, touching would probably not be on their list. In this case, it wasn't just a good reward, it was a fantastic reward. It worked as well or perhaps even better than offering them a food reward. Having something that I can offer in one of these spontaneous moments is huge. Positive behavior training means catching them in that moment doing what you want them to do. If you have to go to the barn to get some treats, you missed the moment. In training jargon, the training technique I was doing was called "capturing." I wasn't luring or shaping the behavior. 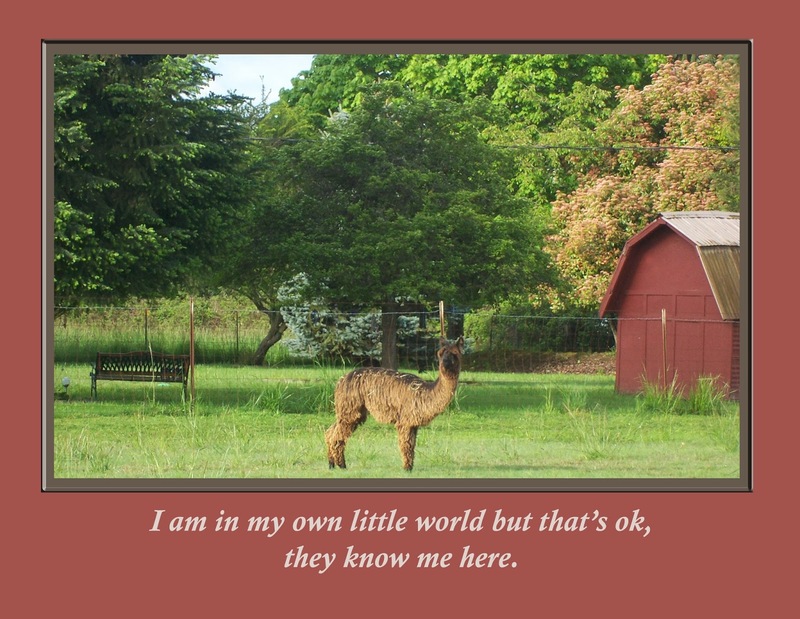 I caught the alpacas in the moment doing something I want to encourage and have become a stronger behavior. Either you need to carry treats and a clicker at all times which some days I'm better at doing than others I must admit, or you need to have another reward system that is like chest scratches and is available where ever you and your alpaca is! 2) During this spontaneous trainable moment, I was actually getting two behaviors trained at the same time. The chest scratch was the reward but it is also a behavior that I want to encourage and become a stronger influence. I was also teaching the boys to take turns and be patient. This helps with them being less spitty, their names are more solidly understood (yes alpacas can learn their names), and it teaches them that they can be patient and get much more goodies than if they get pushy and obnoxious over getting their share of the prize. These guys are smart and at some point, being piggish has been rewarded by either being more dominant to get their feed at supper time or at the hay bin, the hose or treat time. I probably have inadvertantly helped create that behavior too as I hand out goodies. The braver or more aggressive one does seem to win more prizes. It is very normal to see the dominant alpaca get more. It fits that metaphor of the squeaky wheel gets the grease. However, it doesn't always make for a pleasant experience for any of us if it becomes a spit fest and I want the more passive ones to have a turn without me always having to create a special space for us to work. It is much nicer to have them learn to take turns. Teaching the alpacas to take turns so that all can get some treats has to overcome a lot of old reinforcement that was established in their pecking order dynamics. To change that dynamic, I need a real strong motivator. Pellets are good motivators but since that is often the reward that creates the negative behavior in this instance, finding a different reward not associated with the the piggy behavior was not easy to find, but the chest scratches gave me that new reward. I could have done it with pellets but it is a bigger challenge as the trainer to create a successful situation to provide the consistent reward to establish the new behavior. It is doable and I have been working on it with the pellets, but it definitely is much harder and longer to change the old behavior. Chest scratches are a relatively new experience to them so how and when they receive them can be started fresh. I don't have to undo any old ways. Because of that, I must be very mindful for future training opportunities where chest scratches are concerned to make sure the behavior I don't want is not allowed to take hold. Sometimes these spontaneous training moments provide real gems. Here I thought I was just having an enjoyable moment and it became a very powerful training experience! I so do love my alpaca boys. They are a joy most days. Not that they can't also be a pain in the derriere too but most days, they just light up my world. I was out raking up their beans the other day and Calvin walks up to me. His ears are pinned back on his head and the look in his eyes said he was not a happy boy. He tentatively walked up to me and I saw on one side of his face a huge green wad of spit. He had been given "quite a what for" by someone. He was definitely not happy about his situation and looking for some sympathy. I exclaimed, "Oh Calvin that does not look like a happy situation." I bent down a tad to make myself non-threatening and he walked closer to me. I asked if he would like a chest scratch and he stood closer yet so I could give him a nice rub on his chest. He pursed his lips and wiggled them as I scratched the good spot. He was becoming more cheery as I scratched away. Mowgli spied us and saw someone else getting "His" chest scratches so he walked over and threatened to push Calvin away. I told him "no" that they both could get a chest scratch but Calvin was there first so either he can share or not get his chest scratch. Yes, I talk to them that way. I never know how much they understand and I do believe they see pictures and by verbalizing it myself, it helps me picture what I'm thinking to them. Whether or not that is what he heard out of me, I don't know except that he stopped pushing Calvin out of the way and accepted taking turns with getting his chest scratched. I went back and forth between the two of them telling them which one who's turn it was. It was teaching them patience and by being patient they were rewarded with their chest scratch. I watched their feet for signs of them being more antsy and I would quickly change to the one running out of patience. Knowing when to reward to keep them "winning" is so important. You don't want to wait until they fail. You want to reward them before they have a chance at failing. For example with Mowgli and Calvin, the behavior I was working on was patience. Their reward for patience was a chest scratch. How I would know if they were out of patience was if they moved. So by seeing the small sign of a foot being ready to be raised, I'd know to quickly say it was so and so's turn and start scratching the one that was almost ready to move. That kept him in place and I'd see his leg relax and stand still again. It was great watching this method work so beautifully. They stood like that for nearly 5 minutes as I went back and forth rubbing their chests. They were so enjoying it and I was too. I saw Donatello and Djembe come over and watch us. They still aren't quite sure about this chest scratching stuff but they were certainly curious over why Mowgli and Calvin were standing there on their own free will accepting these touches from a two-legger. Djembe came close enough to sniff my hand and head but said that was as far as he was willing to go for now. I started the chest scratching with Calvin when he was a cria. I discovered he liked it and realized that they would since they can't reach that spot with their legs or by rubbing it the fencing or rolling on the ground. If you have ever had an itch that you can't reach and you find someone or something that can help reach it, boy does that ever feel good. Teaching the alpacas about my ability to reach that spot for them has been tremendous in socializing some of them. It often takes time for them to allow me to touch them on the chest but after a few times, they realize, "oh, I like that!" I am careful with the boys to keep good boundaries when I teach them about the chest scratch. It is based on mutual trust and respect and the key there is "Mutual." All my training is based on that concept. 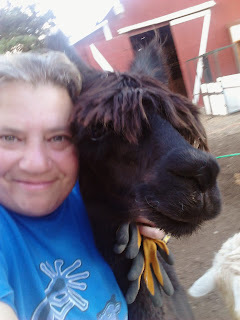 Having healthy boundaries allows me to do more with my alpacas than what you would think normal or possible. They aren't spoiled or allowed to get away with things because of the positive reinforcement work I do with them. As a matter of fact, they get away with less. I don't reward bad behavior. I reward good behavior. And when the good behavior feels as good as these chest scratches, I'm rewarded with really sweet, easy to handle boys. Mowgli giving me a raking break to give him a chest scratch. There isn't anything we do that we don't at some point get discouraged doing. Even the projects, careers, businesses, and loved ones that we are so passionate about go through discouraging times. I certainly have had my share of them. Sometimes it feels like it is one obstacle after another to get over, through or around. Some of the discouragement stems from that voice in our head that loves to point out all the things we do wrong. It sure loves to point out the mistakes and when some obstacles seem overwhelming, that voice really gets loud. I watched an Upworthy video the other day about mothers and how they see themselves. They talked about how they see themselves as mothers and pointed out all the things they felt they should do better. No one was prodding them to look at those negative aspects. They could have said what they felt they were doing right. They all just went to that voice that said, they needed to be more patient, have more time for their kids, or how they hoped that the things they didn't do well at or didn't do enough of wouldn't cause irreversible damage to their kids. Then there was the video clips of the kids talking about how they see their moms. The kids talked about how their moms were their hero, how she made them great meals and how they loved jumping on the trampoline with her or getting their nails done together. The kids just beamed as they talked of their moms. The moms were brought in to watch and listen to the video of their kids talking about them. The fear and anxiety was written on their faces as they walked into the room. Then as the video played and the kids talked about how wonderful their moms were, each one broke into the biggest smile and tears streamed down their faces as each mom realized that their critical voice was really wrong. They were getting an awful lot right where their kids were concerned. You could see the volume turned down on that critical voice as those moms listened to their children. I must admit, even though I'm not a mother myself, the tears flowed from my eyes too. I was touched by this video and then later realized that I have a similar critical voice that loves to play in my head especially when those discouraging times come along. Boy does that voice love to pick out the things done wrong or what I could have been done better. It rarely hears all the things I've been doing pretty well at. I have had some out of town company come for visits lately and listening to them talk about how cool it is to see what I'm doing and how much I have learned over the years and do well at. The things they were seeing being here on my farm and pointed out as what they noticed was just like those kids describing all the great things their mothers do for them. It was stuff I took for granted and didn't notice because I was too busy listening to all the things I wasn't doing well, correctly or fast enough. It was such a great reminder that when I get discouraged, I must look at the entire picture as I assess things. Discounting or ignoring the positive is like adding up half the numbers on an equation. You can't come up with a correct answer if you only look at half the data. If we want to know why we keep hitting so many obstacles, it is probably because in our critic and assessment of what we are doing, is not including the positive pieces. If we included those positive aspects in our review of our business or personal practices, I venture to say, we would find ourselves renewed more quickly and have much fewer obstacles to overcome. I'd even bet that the positive items we could list would far outweigh the negatives. Watching that video made me appreciate as I go out to my pastures and am greeted by Miss Marple and the other members of the herd, the things I'm doing right. The kisses given by Jamilah, the boys asking for chest scratches and offering social behaviors alpacas aren't known for is pretty good evidence that I'm doing a lot right. Jamilah and I enjoying quality time together. 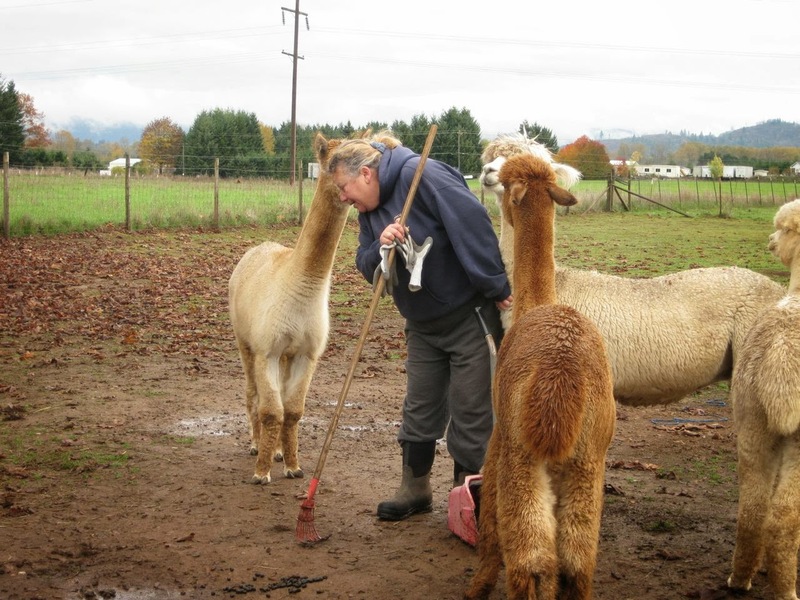 When folks first meet alpacas, they find out that many don't like to be touched. Alpacas jump away if you reach out to touch them. 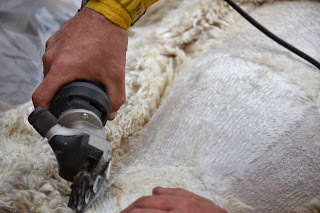 Many of mine do that too, however, I've been working with several of my alpacas using different techniques to see if they will accept touching and enjoy it. The other day, Miss Marple seemed to want to engage in some companionship. I was out doing my chores when she came over to me. I set down my rake and scooper and bent down. She is about 18 months now so not quite full grown. She has always been more social than the norm so a good candidate for me to try different techniques on. I'm getting ready to attend a TTouch workshop next month and have a book that I've been reading through in preparation. I've learned a few techniques over the years and eager to learn more. I went out and concentrated just on TTouches to see if Miss Marple would accept them. She had every opportunity to walk away from me. I did not hold her at all. With one hand I reached under Miss Marple's chin and did small gentle circular touches. She didn't pull back and stood still and even looked up at me. I did those circles for a few moments and then reached moved my hand slowly doing circles towards the back of her neck. She didn't care for that and moved away so I stopped. She came back and I went back under her chin and she stayed still. I rubbed her cheek and chin and I saw her eyes soften more. She reached her head up to touch mine as I bent my head down towards hers. We rested our foreheads together as I did the gentle TTouches around her cheek and chin. We stayed like that for nearly 5 minutes! It was one of the most amazing bonding moments I have shared with an alpaca. When I moved my hand to try the back of her neck or down her neck, she said no and back off and then I'd go back to her cheek and chin and she'd come back and want to put her forehead on mine. I'd kiss her nose and just love on her that way and she was perfectly content to do that for as long as I wanted to do the TTouches in that spot. We were both in heaven. Since doing that, Miss Marple has been more my buddy than ever. She has always been affectionate but if I come in the gate, I get greeted and followed like a puppy dog! It is just so sweet. She has appropriate manners the whole time and sometimes she doesn't want her TTouches but just wants to hang out with me. I just love it! I can't wait to attend this workshop and learn more. If you like reading about how alpacas do things they aren't known for doing, please check out my recently published book, Alpacas Don't Do That.